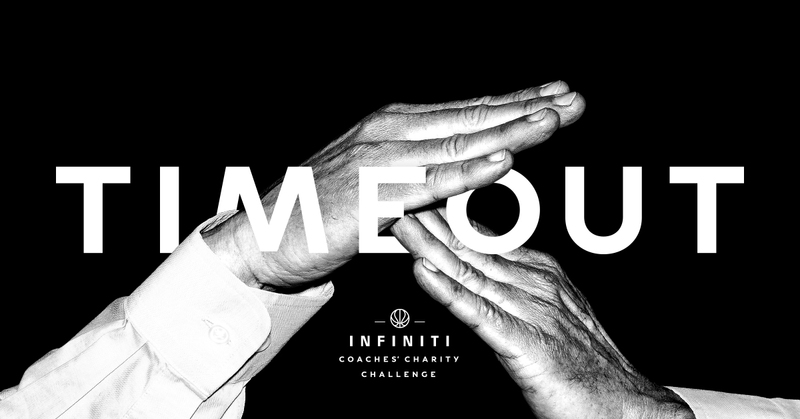 INFINITI kicks off the most exciting season for college basketball with the "INFINITI Coaches' Charity Challenge" and a new creative campaign that encourages fans to take a #timeout2vote for their favorite coaches and charities. The INFINITI Coaches' Charity Challenge is a unique aspect of the brand's partnership with the National Association of Basketball Coaches (NABC), the NCAA® and ESPN. At the start, 48 NCAA® Division I men's basketball coaches compete for fan votes in a four-round contest that raises money for charities of the coaches' choice. INFINITI, an official corporate partner of the NCAA, will make donations throughout the competition totaling $349,000. The further the coaches advance in the competition, the more money they raise for their respective charities. The winning coach will receive $100,000 to benefit his charity of choice. "The INFINITI Coaches' Charity Challenge provides the perfect platform for college basketball coaches and fans to work as a team, providing significant financial support and awareness for so many worthy charitable initiatives," said Jim Haney, NABC executive director. "Numerous national and local charitable organizations are the beneficiaries of the outstanding contributions made throughout the year by college basketball coaches across the country." While only one coach will win the grand prize, INFINITI has guaranteed each coach a donation of at least $1,000 to his chosen charitable organization. Beginning Jan. 2, fans will decide the winner over a 10-week period by casting votes at www.infinititimeout.com. Supporters can cast one vote per day for a coach's charity. For the first time, basketball fans will be able to vote via Instagram and Twitter using the hashtag #timeout2vote. "Every year INFINITI looks forward to working with NABC, NCAA® and ESPN to raise money for charities with the INFINITI Coaches' Charity Challenge," said Phil O'Connor, director, Marketing Communications and Media. "This year, our campaign focuses on the importance of timeouts both on and off the court, and we encourage fans to take a timeout from their daily lives to vote for their favorite coaches and their respective charities." The first round of voting takes place Jan. 2 and runs through Jan. 21, with half of the coaches advancing to a second round, held between Jan. 22 and Feb. 11. From Feb. 12 to 25, the 16 advancing coaches from round two will compete in a third round where only four coaches advance to the final, fourth round which takes place from Feb. 26 to March 10. The coach with the most votes, along with his chosen charity, will be announced on March 11. "The INFINITI Coaches' Charity Challenge is a very successful program that connects our fan base and college coaches in a fun way to worthy organizations and foundations in local communities," said Ellen Lucey, NCAA director of championships and alliances, corporate relations, marketing and brand. "We're pleased to be involved with the challenge this year as the program represents a way to return the support that is given to our member schools and our student-athletes." The challenge is further promoted across the ESPN digital and broadcast network including ESPN, ESPN2, ESPNU, ESPN.com and across several social media platforms. Auburn University coach Bruce Pearl, competing for Children's Harbor, Inc.
INFINITI invites fans to take a timeout2vote for your favorite NCAA coach in the eighth-annual INFINITI Coaches' Charity Challenge.